This portable washing machine is okay. I bought it because everybody said that it was supposed to be quiet, except for some nice musical sounds when it was first started up, but that was definitely not the case. It did that on the lowest cycle (another reason why I bought it- lots of different cycles), but as soon as I had to wash faster, it began to make a racket. And I used the thing in my dorm room. You really don't want to be trying to sleep when this thing is running. Also, it is extremely expensive. 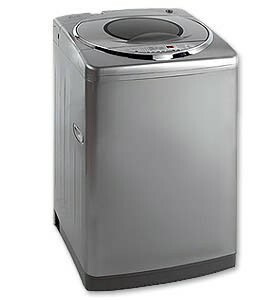 This thing is the same price as any full-sized washer and dryer. Plus, it is heavy. The best thing that I can say about it is that the capacity was great, and that it didn't slow down or get unbalanced when fully loaded, though I did find that the base was a little unsteady when I began to turn it up to the fastest cycle, and I had to put braces around it. That kind of helped with the bad noise problem that I already mentioned, as much of it was from the machine rocking. Also, there was a horrible plastic smell around it for days once I unpacked it. The only other thing that I should mention is that the basked that came with it- stainless steel- is large and awesome, and has stuck around with me for quite a while now. I guess that this would be good if you can find something else to insulate it, so that the noise won't bother you, but that really is my biggest complaint. But if you do buy it, it is of such high-quality physical construction (if not well thought out) that it will last for quite a long time. I got a lemon, in less than a year it started giving me problems.......Had it service and it is as if nothing was repaired. In between washes it indicates E4. I have to turn her off and start the wash all over again.....A 25 minute wash can take up to an hour and half. NOT A HAPPY CAMPER AND WILL NOT BE PURCHASING AVANTI AGAIN. Great washer while it works. Had min e for 3yrs. Then it broke. No one wants to service Avanti washer. can't get parts that easy. Only place for parts is from Avanti if u can get the on the phone. and want to wait for parts. Otherwise this is a super machine for its size. I was almost going to trash it Then I took the drain pump apart found no issues there. Did find a broken wire (yellow/green strip) reattached it to chassie and it works great. If I wasn't handy it would have been trashed. If you get this one or any portable get a repair contract 4 as long as u can. Pay more, get name brand machine u can get fixed.